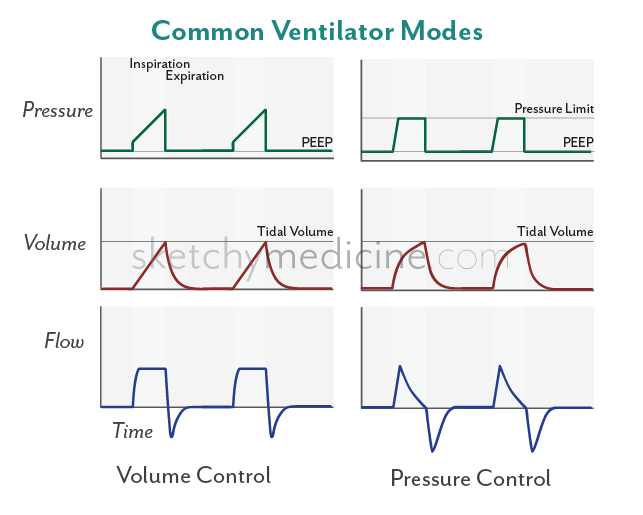 Volume control (VC) and pressure control (PC) are two common modes of positive pressure mechanical ventilation. In VC, the clinician sets the tidal volume that is given for every breath; pressure is allowed to vary over the course of the breath. 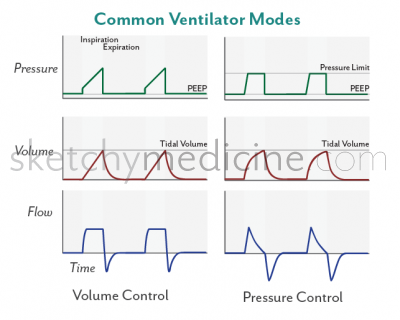 In PC, the ventilator is programmed to deliver the same pressure throughout inspiration, so tidal volume is allowed to vary based on the pressure and timing settings, as well as the patient’s own lung compliance. The timing of ventilation can be set according to a trigger. Continuous mandatory ventilation (CMV) involves setting the respiratory rate and having the ventilator deliver breaths at exactly that rate. This is generally used in paralyzed patients (e.g., general anesthesia), where the patient is not expected to trigger any breaths. In Synchronized Intermittent Mandatory Ventilation (SIMV), mandatory breaths are still given but they are synchronized to the patients’ own respiratory efforts (if present). Also, the patient is allowed to take additional breaths on their own. SIMV is often used to wean patients from the ventilator, by decreasing the rate of mandatory breaths and having patients take more of their breaths spontaneously. Pressure support (PS) is another mode that is used for weaning. No mandatory breaths are programmed. The patient actively takes their own breaths, and the ventilator simply gives an additional boast of inspiratory pressure to help them out. Positive End Expiratory Pressure (PEEP) is a setting that is used to prevent alveolar collapse, increase functional residual capacity, and generally improve gas exchange. PEEP involves programming a small amount of additional airway pressure (often ~5-10 cmH2O) to be present at the end of expiration. Nugent K, Nourbaksh E (Eds.). 2011. A bedside guide to mechanical ventilation. Createspace. Owens W. 2012. The ventilator book. First Draught. Kacmarek RM, Hess DR. 2008. Mechanical ventilation for the surgical patient. In: Anesthesiology (Longnecker DE, Brown DL, Newman MF, Zapol WM, Eds.). McGraw Hill, New York. 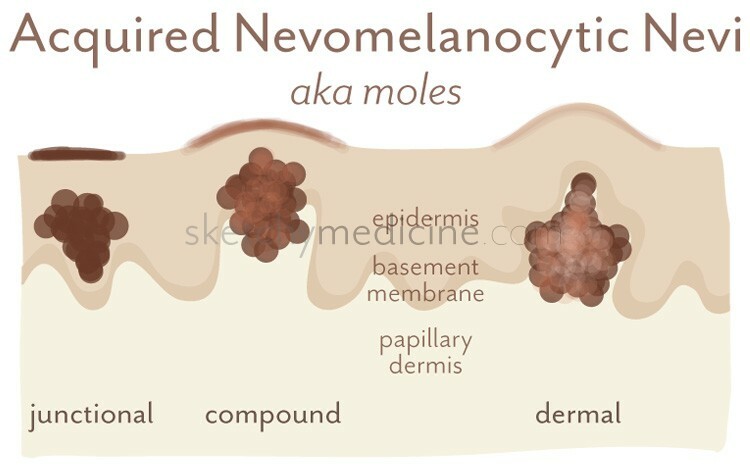 Nevi (or moles) are very, very common. They are generally well-circumscribed dark spots (or “papules” to use the dermatological terminology) that can appear at any time in someone’s life. 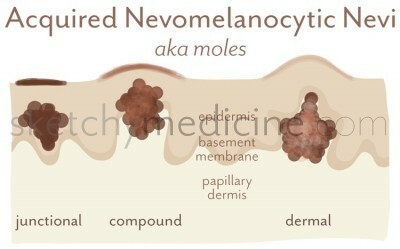 Histologically they are composed of groups of melanocytic nevus cells and can be found in the epidermis, dermis or both. The problem with nevi is that they are pigmented and people tend to get worried about pigmented things on the skin (for good reason as melanoma can be a pretty scary disease). Junctional: the nevus cells are completely in the epidermis, just above the dermal-epidermal junction. Clinically they are <1 cm, flat or minimally elevated and dark in colour. Compound: the nevus cells are in both the epidermis and the papillary dermis (top layer of the dermis), and cross the basement membrane. Clinically they are raised, and a medium-brown colour. Dermal: the nevus cells are completely in the dermis. Clinically they are raised and almost always pigment less as the cells lose their capacity for melanization when in the dermis. They usually have telangectasia and may or may not have hair. They don’t tend to appear until the 2nd or 3rd decades of life. Hypo/Hyperalgesia:Decreased/increased sensitivity to a usually-painful stimulus (e.g., pinprick). Hypo/Hyperesthesia: Decreased/increased sensation to a usually-innocuous stimulus (e.g., light touch). Allodynia: Sensation of pain from a usually-innocuous stimulus (e.g., light touch). Complex Regional Pain Syndrome (CRPS) refers to a chronic neuropathic pain condition with a broad and varied range of clinical presentations. CRPS patients experience severe pain out of proportion to their original injury, and this may start at the time of injury or weeks later. The pain is described as deep-seated and burning/aching/shooting. Sesnory changes are common, including hypo/hyperesthesia, hypo/hyperalgesia, and allodynia. For instance, many patients describe not being able to tolerate the sensation of bedsheets on their painful limb. 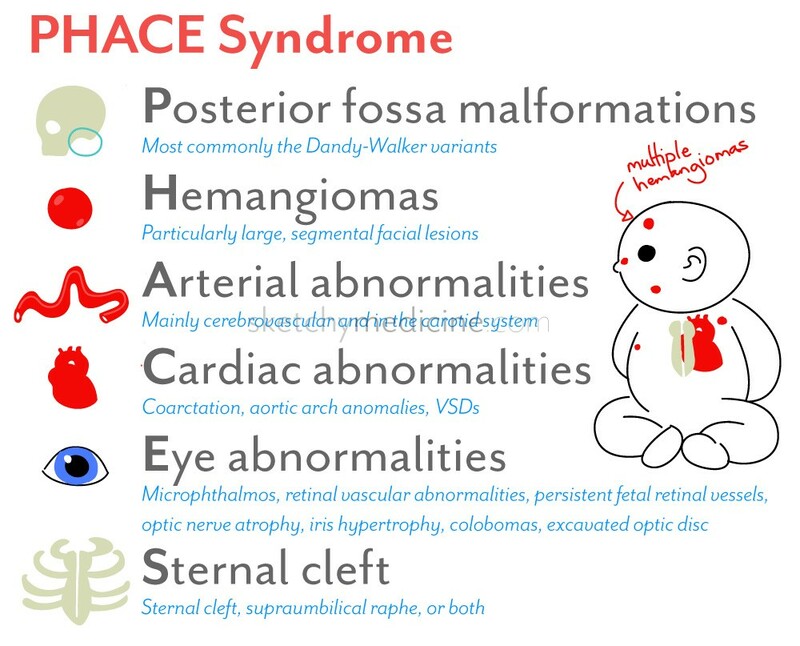 In the affected area, there is often marked edema, temperature asymmetry (usually cooler), and sweating changes (usually increased). Loss of hair and nail growth is common, and disuse of the limb can result in weakness, muscle atrophy, and contractures. 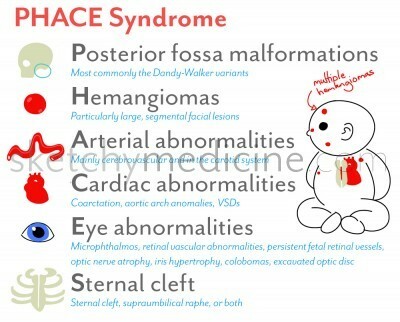 The diagnosis is made clinically, using the Budapest Criteria. Some pain physicians use a nuclear medicine test, three-phase bone scintigraphy, for CRPS diagnosis but this test is becoming less popular, since it has a low positive predictive value. CRPS is classified as Type I when there is no apparent history of nerve damage, and Type II when associated with definite peripheral nerve injury. CRPS most commonly occurs following fractures and immobilization, but can happen even with little to no trauma.The pathophysiology is thought to involve autonomic dysfunction and inflammation, but much is still unknown. CRPS affects females about 2-4 times more often than males, and onset is usually in middle age (though there are rare pediatric cases reported). It is a progressive disease that can result in spread of pain, sensory disturbances, and physical changes to other limbs. Treatment for CRPS may involve physiotherapy, complementary medicine (e.g., acupuncture, qi gong) psychological therapies, and a variety of pharmacologic (e.g., NSAIDs, anticonvulsants, antidepressants, opioids, ketamine, bisphosphonates) and interventional procedures (nerve blocks, sympathectomy, neurostimulators). As with all things CRPS, there isn’t great evidence for any particular intervention. Harden RN, Bruehl S, Perez RSGM, Birklein F, Marinus J, Maihofner C, Lubenow T, Buvanendran A, Mackey S, Graciosa J, Mogilevski M, Ramsden C, Chont M, Vatine J-J. Validation of proposed diagnostic criteria (the “Budapest Criteria”) for Complex Regional Pain Syndrome. Pain; 150:268. 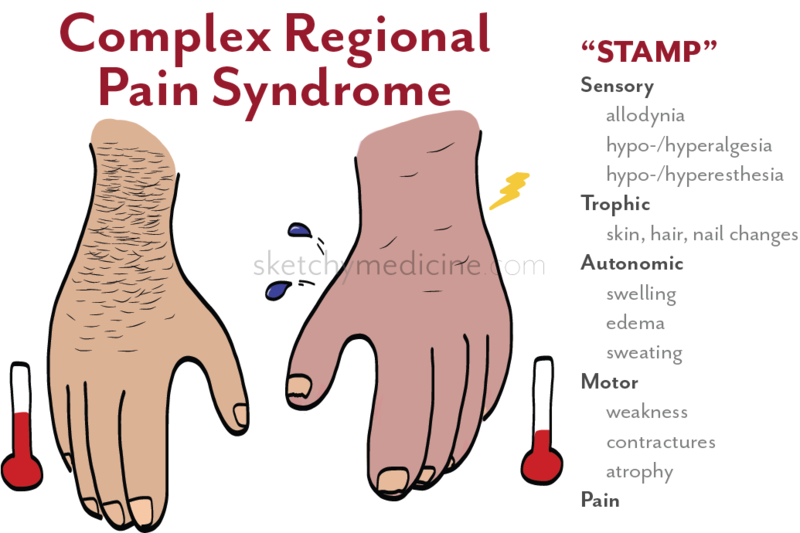 Hord E-D. Complex regional pain syndrome. In: Massachusetts General Hospital Handbook of Pain Management (Eds: Ballantyne JC, Fields HL). Lippincott Williams & Wilkins. Moon JY, Park SY, Kim YC, Lee SC, Nahm FS, Kim H, Oh SW. 2012. Analysis of patterns of three-phase bone scintigraphy for patients with complex regional pain syndrome diagnosed using the proposed research criteria (the ‘Budapest Criteria’). British Journal of Anesthesia; 108:655. O’Connell NE, Wand BM, McAuley J, Marston L, Moseley GL. Interventions for treating pain and disability in adults with complex regional pain syndrome – an overview of systematic reviews. Cochrane Database of Systematic Reviews; 4:CD009416. Schwartzman RJ, Erwin KL, Alexander GM. 2009. 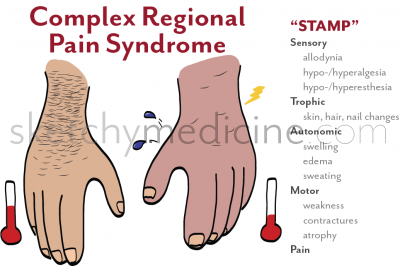 The natural history of complex regional pain syndrome. Clinical Journal of Pain; 25:273. Smith H, Popp AJ. The patient with chronic pain syndromes. In: A Guide to the Primary Care of Neurological Disorders (Eds: Popp AJ, Deshaies EM). Thieme. Tran DQH, Duong S, Bertini P, Finlayson RJ. Treatment of complex regional pain syndrome: a review of the evidence. Canadian Journal of Anesthesiology; 57:149. 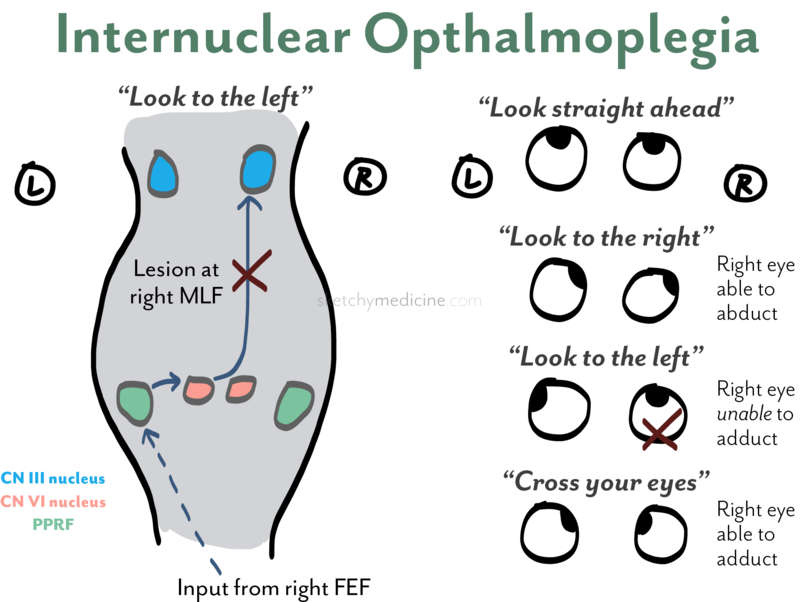 Internuclear opthalmoplegia (INO) is an impairment in lateral conjugate gaze (both eyes looking toward one side), caused by a lesion in the medial longitudinal fasciculus (MLF), and associated with multiple sclerosis. To look to the left, the right frontal eye field (FEF) sends a signal to the left PPRF. 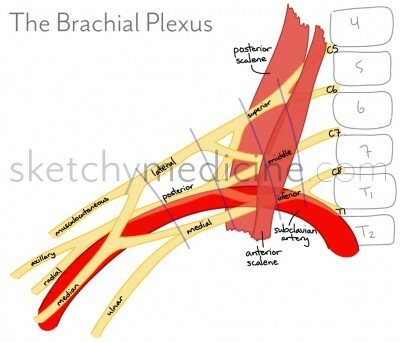 The left PPRF innervates the left abducens (CN VI) nucleus, which controls the left lateral rectus muscle and causes the left eye to abduct (gaze to the left). 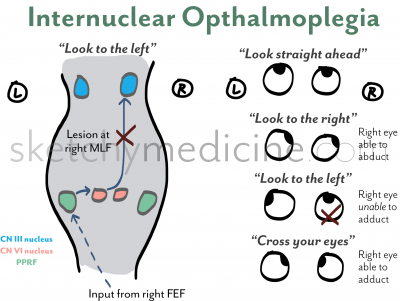 Additionally, the left CN VI nucleus innervates the right oculomotor (CN III) nucleus, which controls the right medial rectus muscle and causes the right eye to adduct (gaze to the left). The MLF is the tract connecting the CN VI nucleus to the contralateral CN III nucleus. In INO, there is damage to the MLF, giving a deficit in adduction of the corresponding eye during conjugate lateral gaze, but convergence (eye crossing) is classically preserved because that is controlled by a different pathway. In very mild cases of INO, the only deficit is a slowed velocity of the affected eye. For naming, a right INO (as in the sketch) involves damage to the right MLF, which means that the right eye can’t adduct to look to the left, but can abduct to look to the right. INO may also be associated with gaze abnormalities such as nystagmus, skew deviation, and even abduction or convergence deficits. The causes of INO include: multiple sclerosis, pontine glioma, and stroke. Flaherty AW, Rost NS. 2007. Eyes and vision. In: Massachusetts General Hospital Handbook of Neurology. Lippincott Williams & Wilkins. Frohman EM, Frohman TC, Zee DS, McColl R, Galetta S. 2005. The neuro-opthalmology of multiple sclerosis. 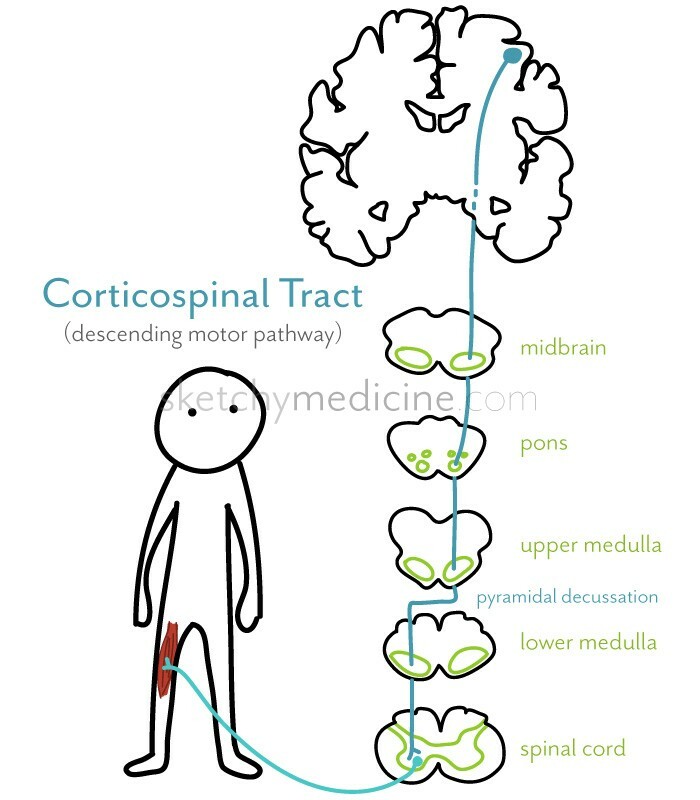 The Lancet Neurology; 4:111. Ropper AH, Brown RH. 2005. 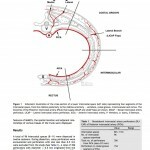 Disorders of ocular movement and pupillary function. In: Adams and Victor’s Principles of Neurology. McGraw-Hill. Wilkinson I, Lennox G. 2005. 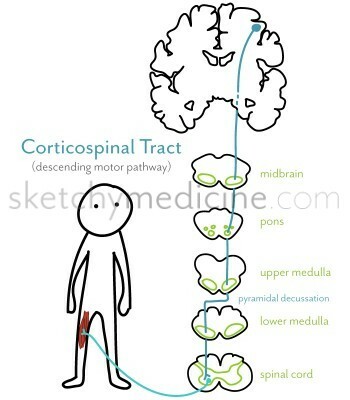 Cranial nerve disorders. In: Essential Neurology. Blackwell. Burns are typically classified by their depth into (or through) the skin. 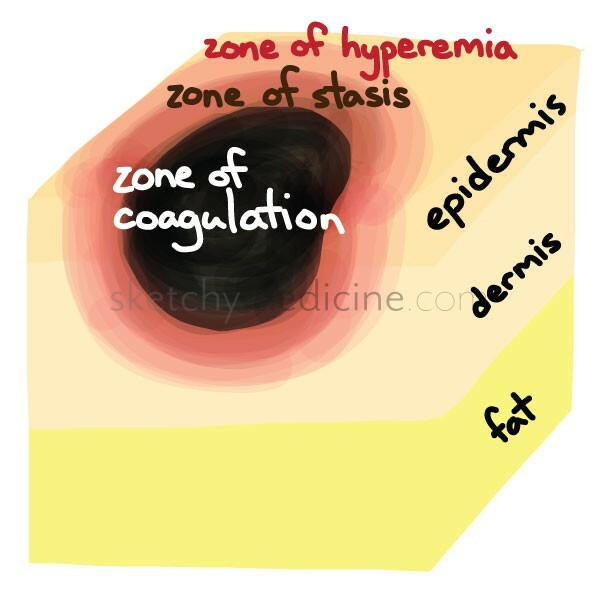 Zone of Coagulation: The cells are dead and their proteins have denatured. Denatured proteins coagulate – think fried eggs. This is what forms the eschar of the burn. Zone of Stasis: The cells aren’t quite dead but the blood supply isn’t the best. If the circulation gets worse (usually due to vessel constriction and thrombosis) the cells in this area will die too. This is why it can take a couple days for a burn to “declare” itself. Zone of Hyperemia: “Hyperemia” means an increase in blood flow, in this case because of vasodilation. The cells in this area are alive and generally recover. The image above shows a superficial 2nd degree burn. A “standard drink” is a measure of pure ethanol consumed. 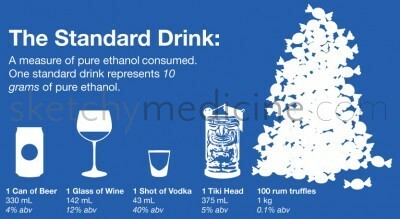 One standard drink represents 10 grams of pure ethanol. This means that based on the alcohol percentage of certain drinks, the “standard” size changes. The important thing to be aware of is to think of it as a Standard Drink because the size that equals 10 g of ethanol isn’t necessarily the standard size that is served. This is why it’s a good habit when asking “how many glasses of _______ do you drink” to ask about the size of the glass. This design was actually originally made for an event, but I’m reposting it here because it’s useful and I like it and I haven’t had a chance to draw anything new recently. A kid without a rash just isn’t a kid. 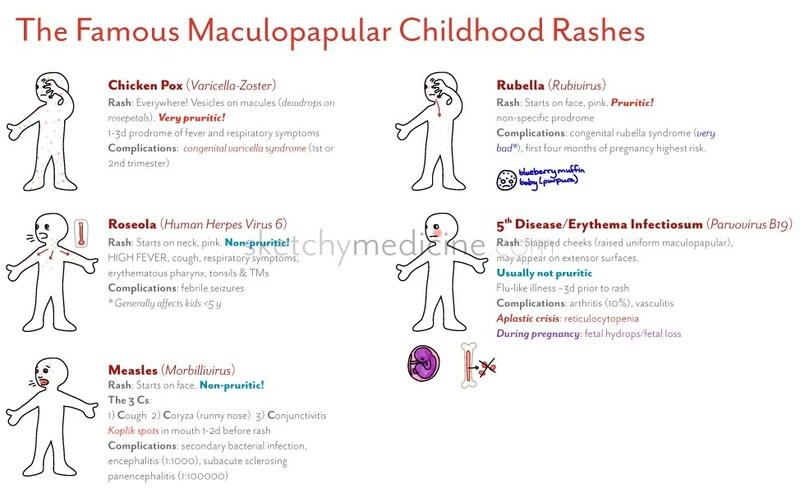 Rash: pink macules and maculopapules, starts on neck. 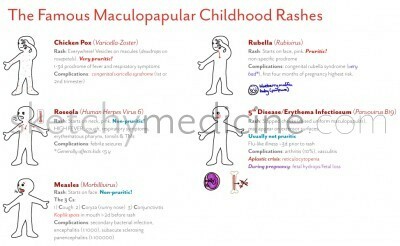 Rash: maculopapular, starts on face. Rash: pink maculopapular, starts on face.